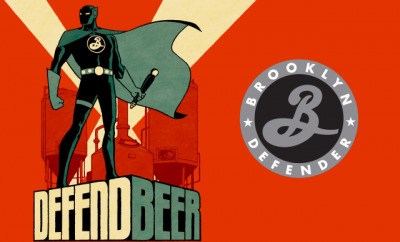 NORWALK, Conn. — ReedPOP, the number one purveyor of pop culture events, and The Brooklyn Brewery today announce the launch of ‘Brooklyn Defender’ – an exclusive American Black Ale specifically created for this year’s New York Comic Con (NYCC). Designed to “strike fear into the heart of those who would forget the virtues of true beer” the latest addition to the Brooklyn Brewery roster has a dark malt visage and hoppy finish that protects the city from the scourge of tasteless beers. In a true nod to the comic book origins of the East Coast’s biggest entertainment celebration, acclaimed comic book artist Cliff Chiang (Wonder Woman, Batman), illustrated the beer’s artwork. The ‘Brooklyn Defender’ will be introduced at a special release party September 21 and then make its’ way to select bars and restaurants. New York Comic Con takes place October 10-13 at the Javits Center. Open bar, giveaways of ten (10) 3-Day Tickets to New York Comic Con, swag & special guests. Chef’s special Chipotle Black Bean Burger and 16oz pint of ‘Brooklyn Defender’ for only $15. Purchase of the combo comes complete with a limited edition ‘Brooklyn Defender’ commemorative pint glass (while supplies last). Since its founding in 1988, The Brooklyn Brewery brews flavorful beers that enrich the life, tradition and culture of the communities it serves. Its award-winning roster of year round, season and specialty products have gained the Brewery notoriety as one of the top craft beer producers in the world. Brooklyn beers are currently distributed in 25 states and 17 countries, and throughout 2011 the brewery underwent an expansion that will double overall capacity by the end of 2013. In addition to facilitating community meetings at its event space, brewery employees serve on not-for-profit boards, including the Prospect Park Alliance, the Open Space Alliance, Transportation Alternatives and the Brooklyn Historical Society. Each year the company supports many charitable and arts organizations including BAM, Brooklyn Museum and MoMA, and partners with food purveyors across the country to produce beer dinners and tasting events. The Brewery is open to the public Monday-Thursday from 5-7pm for reservation-only Small Batch tours, Friday evening for Happy Hour, and Saturdays and Sundays for Tours and Tastings.